Not every business directly uses every piece of customer data. Online businesses with a digital product may not think they need to bother with physical addresses. 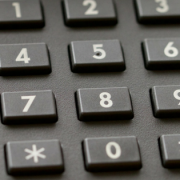 Phone numbers may seem useless to a retail store. But, the reality is that the value of your customer contact data goes far beyond shipping your product. When people give you their information, they’re also giving you information about other customers, and information that helps you identify trends and make decisions. So, if you’re throwing out, not collecting, or ignoring the data points that you don’t use for product delivery or marketing outreach, you’re losing valuable business intelligence. Your customer data is your most valuable source of insights, even if you only use it for analytics. That means that it’s vital that you collect all of it. Even the pieces that you don’t think you need. If you’re not convinced, here’s why you need complete customer data and how to build customer profiles without negatively impacting your customer experience. We’ll leave out the parts about shipping deliverables and contacting customers, since you already know that. These are mostly activities that happen on the backend, which are transparent to your customers, but good for you. First, if you’re collecting complete sets of customer data for every new customer, it’s much harder for fraudsters to make fraudulent purchases, because they need to have all of the victim’s information. Just prompting for more contacting information—like a physical address and a telephone number—acts as passive fraud deterrent, because many credit card thieves only have a name and credit card number. And they don’t want to risk giving an incorrect address. Additionally, if they make a purchase without all the correct contact information, it’s much easier to deal with the fraudulent charge because the incorrect information makes the charge look illegitimate. Ultimately, this is better for you and your customers, since dealing with fraudulent credit card purchases is a headache for everyone involved. Personal contact information—physical address, phone number, email—is valuable even if you don’t need something like a shipping address or a phone number because you’re selling a digital product or your primary salesfront is retail. Customer contact information gives you a roadmap for creating relevant marketing, and sets you up for launching new products. Say you’re entirely digital, then you launch a physical product that you need to ship. Great! But, you don’t have shipping information for your current customers. That’s a bummer. Especially since the extra step of handing over a shipping address increases buying friction, and could cost you sales. Or maybe you want to start text marketing to customers who have already made a purchase at your retail store for more repeat sales. But, you haven’t been collecting phone numbers. Insert sad trombone here. Additionally, social media advertising is incredibly effective and affordable. One of the reasons it’s so powerful is because the targeting is incredibly granular. You can even set up your ads to target people within a specific geographic area. If you don’t know where your customers are, this isn’t even an option for you. For direct marketing, having complete customer profiles makes it possible to segment your customer lists, and target the most valuable segments of your customer base. You can cross-reference your sales numbers with your customer database to determine who your most valuable customers are and where you’ll get the best ROI from direct marketing promotions and offers. The bottom line here is that having complete customer data enables you to build customer personas, and gather information from your market, so that you can make better marketing decisions and deliver more relevant messaging to potential customers. Marketing communication is important. But, communication is also paramount for delivering a good customer experience. People like to know what’s going on with the stuff they purchased. And they want to get in touch easily if they need help. In a simple statement: the more customer contact data you have, the more channels for communication that are available. Each communication channel has an ideal use. Text messaging is excellent for shipping updates and appointment reminders. 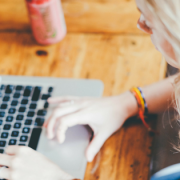 Email is best for communication that needs to be documented, like purchase confirmation and receipts. Phone calls are the backbone of tech support. You may not have all of these channels up and running right now. But, if you try to add new channels without the customer data to support them, it’s going to be tough. So, get all the data now, or you could be scrambling for it later. Automation, artificial intelligence, and all the other technologies are awesome. You should use them. But, these tools are only as good as the resources you give them. If you have an awesome customer data platform, but no data to feed it, you won’t get much benefit. So, it’s important that you’re collecting as much data as you can, and using good customer data collection tools to ensure that your customer data platform builds a robust customer database that improves all aspects of your business. The more personalized your customer service and shopping experience is, the happier your customers will be. Then, it will be more likely that they’ll make repeat purchases. Repeat purchases are the most valuable. So, this is the best case scenario. But, you can’t deliver personalized customer service and shopping experiences if you don’t have personal information about your customers. There are two types of customer data that are most valuable on this front: behavioral and contact data. Behavioral data is largely collected by your marketing and analytics platforms. Those systems monitor all the customer actions and record the transactional data. Personal contact data enables you to customize the customer experience based on their geographic location and be responsive to customer service requests. More responsive brands get better customer loyalty. You customer data increases your customer lifetime value. The market should guide your R&D. If you deliver what your customers want, they’ll buy your stuff. End of story. You need to know who your customers are to make smart decisions about the direction of your brand and new offerings. Knowing your customers includes analyzing survey data, behavioral data, and personal data. This is how you get a complete picture of your customers, so you can build better offerings that directly address your customers wants and needs. As you can see, customer data does a lot for you. So, clearly, your data collection and completion resources are incredibly important. They may be your most valuable tools. There are a lot of tools available for getting all the customer data you need. Many of them are passive and integrated into other software. Social media platforms and analytics suites organically collect transactional and behavioral data. And there are tons of survey tools for gathering customer feedback. However, collecting customer contact data is a bit trickier. You either have to ask for personal information or gather it based on whatever information you already have. Asking for personal information can create friction during the buying process. And people often make mistakes or intentionally give bad data. So, tools that make personal data collection more transparent will improve your data quality and customer experience. These are the two methods we’ll focus on here. Data integration is the most transparent way of collecting customer data. In most cases, the customer won’t even notice that it’s happening. This involves using an API to connect your point of sale system and CRM system to a data processing service. This way, you can verify and complete customer information in real time as they enter in on form fields, or clean the lists in your CRM database. 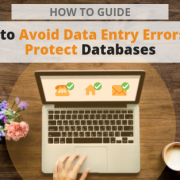 The advantage of data integration is that you can use it to protect your customer databases by preventing incorrect or false contact data from penetrating your customer contact lists. And you can automate the process of updating and verifying the information that’s already in your databases. This saves you time and money. Additionally, it minimizes manual data entry, which is the single biggest source of bad data. So, your customer data stays accurate, even as you use it. Data processing is efficient. But it involves some manual work. 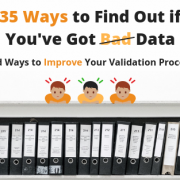 Data processing validates and completes your customer data after it’s been collected. You upload contact lists from your customer databases. Then, the data processor validates and completes each entry, and returns the data in a comma-separated .CSV file, so that you can reload it into your database. You must upload your lists and reload them into your database manually. So, this process is a tad less efficient than data integration. However, for many businesses, it’s the best option, because they don’t have the right platform for data integration. These two customer data collection methods cover every business. With one, or both, of these, you can get complete customer data without bothering your customers. 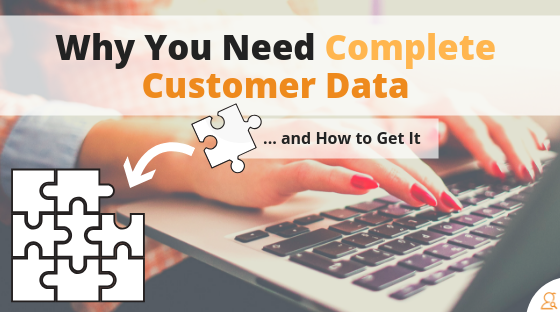 If you’re not collecting complete customer data, nearly every aspect of your business will benefit from adding a data collection process and getting more information about your customers. If you’re ready to start getting all the information and making better, more customer-focused business decisions, you can add data integration or data processing to your operations with very little effort. Check out the Searchbug APIs and batch processing services to discover what data you can get with data collection tools and what you can do with the information. 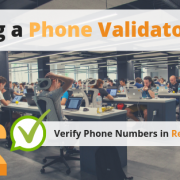 How Do Use Your Customer's Phone Numbers?